In Lost Planet 2, if you want to swap your grenades for the T-ENG Gun (a device that lets you transfer precious Thermal Energy to your injured teammates), you press Y and Left Trigger simultaneously. Be careful, though -- if you press Left Trigger a fraction of a second before you press Y, you'll chuck a grenade at your teammates, which they likely won't appreciate in their state of physical distress. While far from the most important aspect of the game, this cumbersome button mapping is indicative of the whole Lost Planet 2 experience: It's a completely functional, interesting gameplay mechanic, but it's utterly hamstrung by a nonsensical design choice. Unfortunately, the game suffers from so many of these flabbergasting and terrible design choices, that even its strongest features can't stand up to much scrutiny. There have been some significant changes to the face of the franchise since its initial appearance during the Xbox 360's earliest days. Rather than force the player on a one-man crawl across a desolate, alien-infested tundra, Lost Planet 2 has taken cues from one of Capcom's (far more successful) franchises, Monster Hunter. 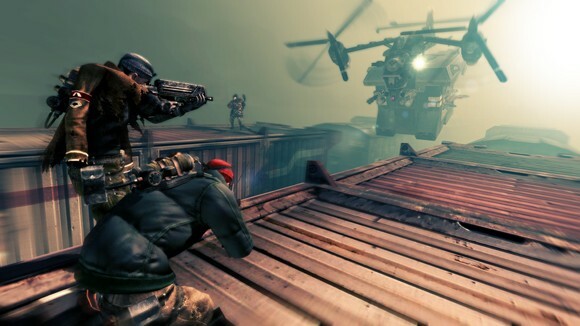 The game's Campaign mode was truly designed for four players, who embark on bite-sized missions across a number of gorgeous, varied environments. After Lost Planet's snowy homogeny, the sequel's changing landscapes are pretty refreshing. There are even a few RPG elements in there. Most of the game's larger monsters, or "Akrid," drop credits that can be spent on upgraded weapons or abilities. Unfortunately, these upgrades are awarded randomly by a slot machine -- a nefarious device that, nine times out of ten, will simply exchange a player's credits for superfluous rewards like emotes and pseudonyms you can use to represent yourself while playing online. Moving, jumping and grapple-hooking through the world of Lost Planet 2 is a pretty slow and clumsy process. Surprisingly, though, that's not as much of a hindrance as you might think. You just have to choose your actions a bit more methodically, as they take just a fraction of a second longer to execute than you might assume. Unfortunately, the sluggish controls are exacerbated by what might be Lost Planet 2's most frustrating design choice: Every single enemy has methods of interrupting your actions. While being shot, you lose your ability to shoot back, throw grenades, heal, or do pretty much anything but run away from the thing shooting you. On top of that, most enemies have a method of knocking you back -- either by blasting you with a shotgun, hitting you with an explosive device or swiping at you with a grotesque mandible. Enemies will exercise their ability to knock you back with exasperating frequency. It's a minor annoyance during most of game's missions, but it completely ruins Lost Planet 2's massive, potentially awesome boss fights. You'll encounter more than a dozen towering, intricately designed bosses during the Campaign, but each fight plays out roughly the same: Find the best weapon, shoot the glowing weak point, get knocked back, heal, repeat steps two through four for twenty minutes. One mission has you fighting across the length of a speeding train, which sounds absolutely thrilling on paper. Unfortunately, said train is equipped with a number of missile-launching turrets, which are supernaturally skilled at tossing you from the vehicle and to your doom, even if you happen to be inside of one of the train cars. This level, in particular, is a crime against reason, perpetrated by criminals. Playing through the game by yourself is ill-advised, especially since some segments require you to accomplish certain objectives simultaneously, with zero help from your completely useless AI companions. Playing with other humans makes these situations bearable, but even when basking in the warmth of fellowship from up to three online compatriots, Lost Planet 2's repetitive, frustrating missions simply aren't much fun. It's such a shame, because the game's built on seemingly strong foundations. It looks and sounds incredible. Its catalog of weapons and mechanized "Vital Suits" is expansive and surprisingly varied. There are a metric ton of (randomly acquired) character customization options, all of which can be carried over to the fairly enjoyable 16-player online competitive modes. After spending a few hours with the game, though, you won't be thinking about its strengths. You'll be thinking about the wide range of curiously bad design choices Capcom has made. Like: Why is there almost no tutorial? Why can't co-op players join your game in the middle of a mission? Why is water traversable in some missions, but lethal in others? Why can your grappling hook only connect to some surfaces? Why is your healing ability mapped to the Start button? Though it may seem nit-picky to highlight these flawed ideas, they converge to detract from any enjoyable experience you might have with the game. Ultimately, though, Lost Planet 2 suffers due to the developers' biggest and most befuddling conceptual misstep: They made a game about killing yacht-sized monsters while riding around in robot suits armed with lasers and rocket launchers -- and then they somehow made it boring. 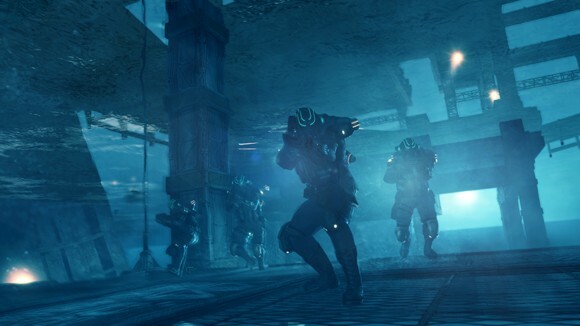 This review is based on review code of the 360 version of Lost Planet 2 provided by Capcom.